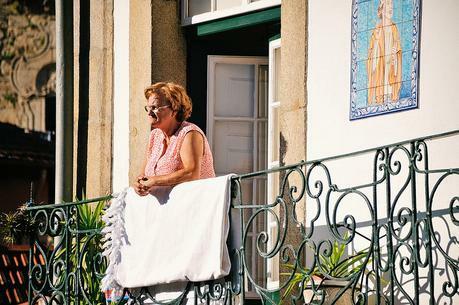 As of 2013, the freguesia (civil parish) of Miragaia has been rolled up together with the other former civil parishes of Cedofeita, Santo Ildefonso, Sé, Vitória, and São Nicolau in Porto’s historic district to become União das Freguesias de Cedofeita, Santo Ildefonso, Sé, Miragaia, São Nicolau e Vitória. A mouthful, isn’t it? But consolidation doesn’t change hundreds of years of history; each freguesia continues to identify as a distinct neighbourhood with its own set of characteristics. For Miragaia, given its location by the river and a major thoroughfare, that can be a bit like living in a fishbowl. Yes, taking photos of people on their balconies is contributing to the fishbowl effect. But the alternative is to try and shoot the neighbourhood without people, and it wouldn’t be Miragaia without people. 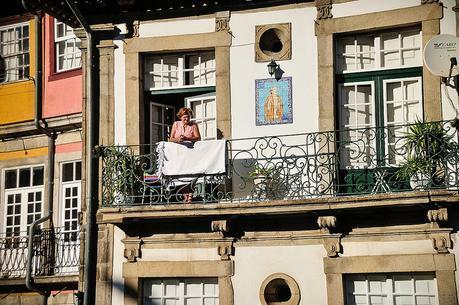 This is an ancient, dense quarter where neighbours chat across balconies while hanging laundry. Cats lay along window sills and lounge by restaurants, waiting for scraps. Kids chase each other under the arches. Everyone is so close together you know what’s cooking for lunch. 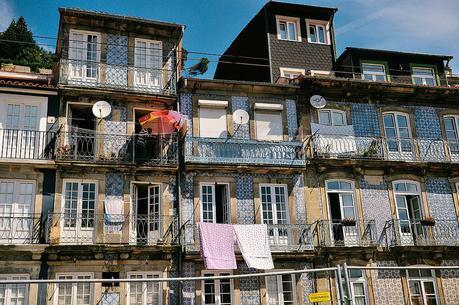 Miragaia is a busy area: it faces Alfândega do Porto, the former Customs building and currently a congress centre for many of the city’s large-scale events. With a building like that comes a very large parking lot, so you can imagine how bad the traffic can get. I took these pictures when I was coming and going from the media centre for the Red Bull Air Race at the beginning of the month. I also took a batch over the three days I was at the media centre in Alfândega for the F1H2O Grand Prix of Portugal boat race (which I would love to see return to Porto). Some tourist-oriented operations in Miragaia include Look At Porto (a 5D tour of Porto), World of Discoveries (museum), and Armazém (a former warehouse converted into a multi-use space including vintage retail, bar, and gallery). Part of Miragaia is below road level and we often park around there when meeting people in Ribeira, so it’s an area I know better than some others in the centre. 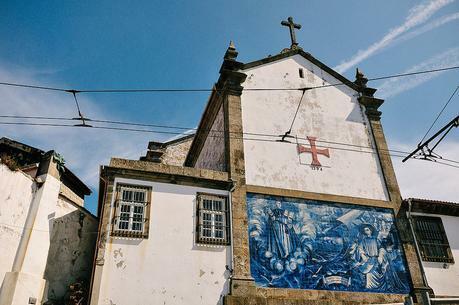 But I have not been inside this church yet — Igreja de São Pedro de Miragaia — although I’ve admired those azulejos while looking out the windows of trams, boats, cars, and on foot. 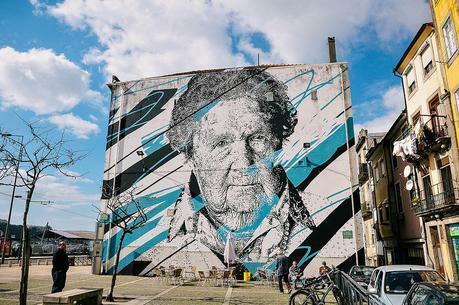 This photo below is from March 2016, but the mural is still there and unmissable if you’re walking west from Ribeira. “MIRA” is by Portuguese artist Daniel Eime in Largo Artur Arcos. I will be interviewing him later this year to talk about his art and the business climate for artists in Portugal, part of an interview series I’ve got in the works which will be in both Portuguese and English.